Above The Rest Lodge has five lodges that are available year round (minimum of 2 day stay is requested) and may be reserved by writing or calling. Rich's Cabin has 2 double beds in each room, a pull out sleeper sofa with handmade quilt on each bed. This cabin has one and one half baths with tub/shower combination, a fully equipped kitchen, TV and VCR and cedar lined closets. This cabin is capable of sleeping up to ten people. The cost is $185.00 for 1-6 people, $15.00 for each additional person up to 10. The Nest has one queen bed in each room, a pull out sleeper sofa with handmade quilts on each bed. This cabin has one bath with tub/shower combination, a fully equipped kitchen, TV and VCR, cedar lined closets and is capable of sleeping up to six people. The cost is $160.00 for 1-4 people, $15.00 for each additional person up to six. Steph's Cabin is a cute cottage style with a loft bedroom with one queen size bed, handmade quilt, and sleeper sofa. 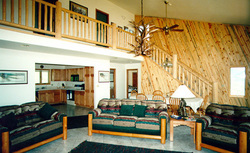 This cottage houses a washer & dryer, wood burning stove, TV and VCR and spiral staircase to the loft area. The cost is $125.00 for 1-2 people, $15.00 for each additional person up to four. The Mansion is the largest of the 4 cabins. It has 4 double, and 2 queen beds, a pullout sleeper sofa with handmade quilt on each bed. This cabin has 2 1/2 baths, fully equipped kitchen, washer and dryer, TV and VCR, cedar lined closets and is capable of sleeping up to 14 people. The cost is $250.00 for 1-10, $15.00 for each additional person up to 14. Shirley Bell's same offerings as the Mansion, less the 1/2 bath, satellite TV, handicapped access. The cost is $260.00 for 1-10, $15.00 for each additional person up to 14. Satellite in all cabins except Steph's Cabin. Directions: Above the Rest Lodge borders Yellowstone National Park, overlooking the Yellowstone & Gardiner River, viewing Mammoth Hot Springs. Its located 1 1/2 miles above Gardiner on the Jardine Road. Coming from Livingston, Montana, turn left across from the Exxon gas station before the bridge. Coming from Yellowstone National Park, turn right after crossing the Yellowstone Bridge just past the Absaroka Motel.